Design requirements for 24 GHz and 77 GHz automotive radar sensors are becoming more stringent as consumers increase demand for applications like blind spot detection (BSD) and lane change assistance (LCA). In turn, the engineering departments at Tier 1 suppliers like Delphi, Autoliv, and Continental are advancing technology in order to win bids from OEMs like BMW, Audi, and Chrysler. Simulation technology has also advanced to meet design requirements. Remcom offers an integrated approach from sensor design to drive test scenarios. Remcom’s time-domain electromagnetic simulation software, XFdtd, is a proven tool that promotes the rapid development of automotive radar sensors. Using simulation, RF and application engineers are able to analyze the far-field radiation characteristics of their antenna, minimizing the number of prototypes built and tested in a lab. Determining a matching radome while accounting for all the complexities in a full sensor model: RF board, radome, packaging, data connector, case, etc. Remcom’s ray-tracing simulation software, WaveFarer, augments repeatable track tests and drive scenarios. Simulating raw radar returns from a set of scenarios allows engineers to gain insight into a design, placement, or target identification algorithm without the overhead required to install prototypes and take measurements. Antenna engineers can determine if an antenna design or radome structure has a positive impact on target identification without building a prototype and performing a series of tests in a lab. Application engineers can determine the effect of multiple antenna placements behind a bumper without needing to complete a series of tests on a track for each placement installation. Signal processing engineers can generate a set of drive scenarios to test signal processing algorithms on raw radar returns without the overhead of running a measurement campaign. Ready to evaluate Remcom's EM Simulation Solutions? A convex dielectric lens, designed for 77 GHz, is compared against a similar plano-convex lens using XF. In this article from the International Journal of Antennas and Propagation, fabrication of a high resistivity silicon based microstrip Rotman lens using a lift-off process is presented. 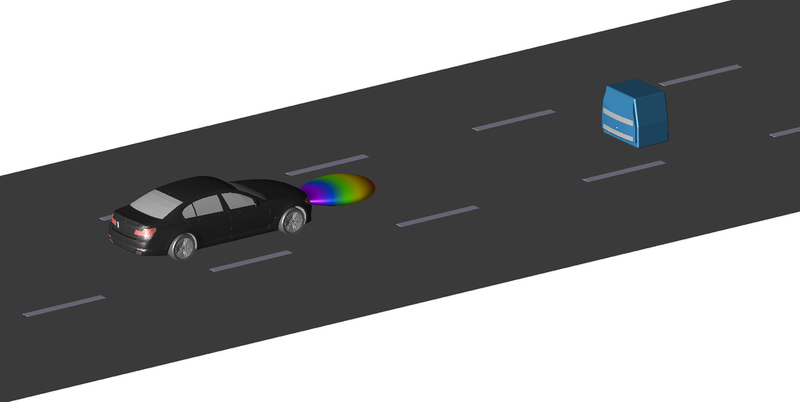 Electromagnetic simulation has been used by RF engineers for many years to aid the design of automotive radar sensors, but the increasing demands of advanced driver assistance systems (ADAS) are changing the methods used. This paper introduces FDTD’s advantages for automotive radar circuit and systems level designers, including simulation of very large problems, more efficient memory requirements, and the ability to reveal sources of coupling. This whitepaper demonstrates how XFdtd's time-domain approach enables rapid development by allowing engineers to determine the performance of a fully detailed sensor model installed behind a piece of fascia without needing to build prototypes and run tests in an anechoic chamber. The analysis of a 25 GHz sensor frames the discussion. This paper outlines the advantages of FDTD EM simulation for analyzing antenna-in-system designs that include both the antenna package and the automobile body features surrounding the device. An XFdtd simulation of a radar mounted in the rear bumper of a sedan provides the framework for the discussion.